Dheekra was the single word that started my love affair with Parsi food. I had heard that word many times in Indian movies. Growing up abroad I did not know what it meant. I asked my father. It means a "child" he said, it is Parsi. What was Parsi? Who were these people, always portrayed in the movies to be a fair skinned intellectual lot? Dad told me of the legendary meals he had had in Mumbai as a child at the homes of Parsi friends. The dishes that melded sweet and sour and spicy and salty. The elaborate preparations that made each guest feel like a king. I had to learn more. Mistry and Bapsi and so many others. I began to scratch the surface of a very complex culture. I fell in love with the characters they created, living together in a multi-storey building in Mumbai. A community that is small in number, it has contributed to the worlds political, business and arts in amazing ways. Think JRD Tata, Godrej (Indias leading business families) and Zubin Mehta . . . when you think of Parsis. They are a very intellectual community, very talented. They came from what was Persia, now Iran, and landed in India in the state of Gujarat. Their cuisine is a tantalizing marriage of Persian and Gujarati styles. Flavoring their curries with nuts and apricots, they brought the richness of Persia to the simple Gujarati food. Parsi food is not hot with chilies but has complex flavors and textures. They are primarily non vegetarians and enjoy eating chicken, mutton and eggs. I present to you two of my favorite Parsee recipes from my upcoming book. As the Parsis say "Chalo jumva avoji . . . Come, let's eat". (You can find more of her recipes on the site if you just enter her name in the search box on the left or top of the page). A new young voice in Indian cooking, Monica Bhide was probably born with a mixing spoon in her mouth! Since the age of ten, cooking has been a lifelong passion for this accomplished caterer and home chef. Monica specialises in Indian cuisine and has prepared everything from an intimate dinner for two to large parties of 40. A graduate of several formal cooking courses in her native India, she is also a voracious cookbook reader and counts hundreds of cookbooks in her collection. Frustrated by the lack of straightforward Indian cookbooks, Monica became inspired several years ago to develop simplified and healthful versions of her favorite Indian dishes. 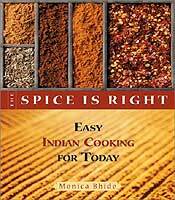 The result is the collection of mouthwatering Indian recipes in her book The Spice is Right, where Monica, in her down-to-earth and lively writing style, guides Indian food lovers on a non-intimidating and flavourful foray into home-style Indian cooking.